I hope you had a lovely weekend! I had a fantastic weekend, particularly because it wound up being an extra-long one, filled with coffee with friends, all-you-can-eat sushi birthday dinners, lots of sewing, catching up on Gossip Girl, a sweet letter and package from Mia, and a visit from Annie, in town from New York. We went eyeglasses shopping and I was itching to get a new pair myself. So tempting, but I couldn't do it. Annie is such a pal, I wish we could hang out more often! On Friday, before heading over to an opening the gallery where Geoff has been working, I stopped off at Presse Internationale on College Street because the darling of an owner/manager (who was absolutely mystified as to why this magazine is so popular!) 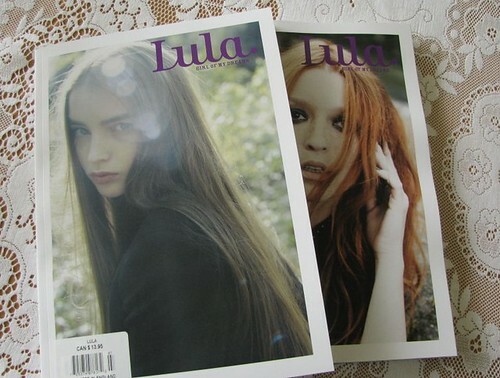 had set aside two copies of Lula for me. One for me, one for Erica. Maybe it's just me, but this issue is very goth! That means I love it! I bought it (and a slouchy black cardigan to go with it, because Tara-Lynn is right and sometimes you just have to splurge on yourself)! I'm wearing it now and I am very happy with it. One thing, though: it has hidden, in-seam pockets, which are kind of cute in theory but which I find impractical in practice. Because of the way this blouse fits on me (a bit fitted at the hips), I know I'll always tuck it in. The pockets create entirely too much bulk, then, in the place where I need it the least. So I took my seam ripper, popped them off, and stitched up the sides. The result is a 100% perfect blouse! n.b. I've been feeling guilty about something I wrote in that post; I don't hate on cashiers, ever, unless they're outright rude, and I was kidding in that instance. A man at a bookstore I worked at once yelled at me and made me cry because the lineup was long and the "real" bookstore across the street was out of the Sunday NYT. Even if it makes me a pushover sometimes, I will never be like that man! It's just not worth it. I want to make a quilt as a wedding present, and oh boy, is it ever difficult to make a decision! I think I'm going to make a super, super simple one because I've never made a quilt before: the "Six of One, A Half-Dozen of the Other" from Last-Minute Patchwork and Quilted Gifts. Picking out a fabric has been agony, though! I want one really fantastic print that I'll use with a solid colour, and I think I have settled on the one I want. 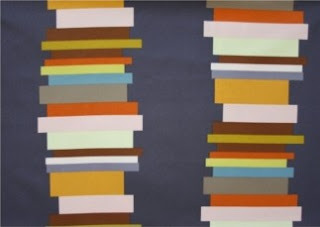 This is "Volumes" from the Anna Maria Horner "Drawing Room" line. Home decor weight, but that's fine. I love it. I think it's perfect for the couple, who are very bookish, and who love colour (there are brighter colourways but I think I'll stick with this more subdued one). I deliberately stayed away from ornate florals or anything too cutesy, because the quilt is not for me! How I'm going to actually quilt the thing, I'm not sure (The Workroom's sew-by-the-hour to the rescue? ), because my sewing machine is teeny-tiny. I am nervous about ordering the fabric because they know I'm making them a quilt and the pressure is on! I hope it won't be too plain. There's a lot riding on these little volumes! 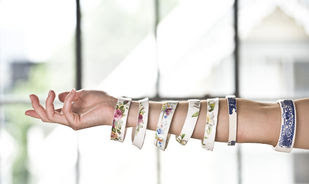 I love these teacup bangles from Linsday Pemberton! She takes porcelain teacups and slices them with a diamond cutter. I'll take three, please!